Memphis, here I come! I'm very excited to be playing at the big ol' Folk Alliance Conference this year. Here's the deal... Timmy Riordan is writing a song a day for all of February. I am only writing one (well, only one in conjunction with this project), and I am doing it tomorrow, Feb. 4. There is more info on Tim's project at The Song Bomb, but in a nutshell, he is doing this to shed the fear of writing something bad. His philosophy, "let's just write a song." Now, to the real heart of the matter: What shall we write? Answer: Anything You Want. Remember, this is Fearless Songwriting!! We are combining two ideas that we had. Our first prompt is the word "Burlesque." (You can thank Timmy for that one.) My contribution is an idea that I got from Matt Meighan, which is to use a "word stream" to generate material for the song. A word stream is a series of words derived from brainstorming based on sound; you start with one word, then let your mind find another word that in some way sounds like your first word. Then use the second word to do the same thing. For instance, you might start with "blue", then maybe "shoe" would pop into your mind. You'd write that down. Then maybe your next word would be "shark" or "true" or "smelly". Really we're trying to base the list on the sound of the word, but if "smelly" pops into your mind, write it down and continue. There are NO WRONG ANSWERS. So, Friday morning, before I've even had my first cup of coffee, I am going to write the word "burlesque" at the top of a piece of paper, and I am going to do a word stream for 10 minutes. Then I am somehow going to use the words in my stream (some or all, probably not all, but who knows?) to start my song. How about you? What are you going to do? I can't wait to hear about it. Fearless Songwriting. No Wrong Answers. Have At It. This weekend's CD release concerts were so much FUN. Thank you to everyone who came out and made them successful! Before the show at Tsunami Books in Eugene on Friday, I stopped by the studios of KLCC in downtown Eugene for a chat with Tom Krumm. You can listen to our interview about the CD, my musical influences, and how songwriting has changed for me this year. Stay tuned, my friends. You never know when I might launch another project! I am just now finishing a full-length CD with 11 songs (7 are mine, 4 are borrowed) and some of the best pickers in the NW and beyond (Jonathan Byrd, Dale Adkins, Jeff Smith, and Lincoln Crockett to name a few). The CD October Valentine will be available for purchase from me at shows and through my website starting at the end of November. (I will DEFINITELY let you know.) The Portland “pre-release” concert is on November 29, 2009 at Mississippi Studios. The band members will be Dale Adkins (guitar, banjo), Suzanne Pearce (bass), Richey Bellinger (octave mandolin, dobro), Skip vonKuske (cello) and Lincoln Crockett (guitar, mandolin). The official release will be January 1, 2010. That is the date on which the CD will be available in stores and on iTunes, CDBaby, etc., and we’ll do more CD release concerts around the NW in early 2010. One reason for the “pre-release” concert is to be able to play the Portland release concert with Lincoln Crockett who has been a huge part of my musical life this year. He is about to take a break from performing and embark on other adventures, and had the idea for a double-bill with him and his band, the Enemies. It’s a “farewell-for-now” show for Lincoln and a CD release for me. The other reason is to give YOU, my amazing supporters and fans, the opportunity to get your very own copy of "October Valentine" (and copies for all your friends and loved ones) before 2010. I will let you know the minute they are available! It’s going to be a great show marking the beginnings of new chapters for both Lincoln and myself. Hope to see you there. I GET TO BE ON THE RADIO! In the studio Lincoln and I traded tunes, and backed each other up, and had a ton of fun in the process. Tom interviews us both, so hopefully you’ll learn something about each of us. If you are not on Pacific Time, go to River City Folk, click on the “Internet Broadcasts” link, and publicradiofan.com will help you find a broadcast in your time zone. LUCKY FINN ON YOU TUBE! If you were thinking of staying home next Sunday and NOT catching Lucky Finn for FREE at the cutest little coffeehouse in Sellwood where you can also drink a yummy porter or glass of wine, you are NUTS! To prove it, I've posted this video of us at Trout Lake, WA. Come join us! We love you! "SONGWRITING IS NOT A COMPETITIVE SPORT." So says Guy Clark. And we know it’s true. But contests are a lot more than just competitions. We performers have to raise our game a little, craft that perfect line, control the nerves that are certainly set on edge by performing for our peers. Tonight the Portland Songwriter’s Association held the finals of their annual competition to name the Performing Songwriter of the Year. I am very proud to announce that I somehow nabbed the title of “Runner-Up.” Congratulations to the winner Lisa Forkish and to all the fantastic songwriters showcased throughout the competition. May we continue to write with our hearts and inspire each other! IT'S VALENTINE'S DAY. PASS THE CHOCOLATE. So what if today is Valentine’s Day? I did my celebrating last night at Airplay Café, joined in a night of miserable, heart-wrenching, sad love songs by Kate Mann and Paula Sinclair. Thanks to all of you who came out hankies-in-hand to shed a tear and have a laugh at the romantic mishaps we shared. 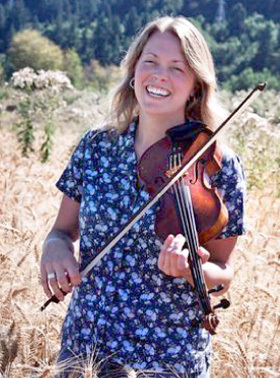 Tomorrow I head over to Sisters, Oregon to record some fiddle and harmony vocals on the forthcoming recording of my friend Kathy Marshall. We shared a tee-pee at the Americana Song Academy in 2006, and now with the help of Brent Alan, Kathy is recording some of her beautiful songs. What you may not know is that we found a third. Nicolas Miranda, guitar-superhero has joined us in our endeavor to bring prog-folk to the masses. We are calling our trio Lucky Finn. This weekend we had a blast playing the Grange in Lincoln’s new hometown of Trout Lake, Washington. Saturday was our third show together, but our first real Concert. I mean, the guys wore suits. It was the real deal. We played hoppin’ bluegrass tunes and songs written by Lincoln and myself. Lincoln’s harmonies add so much to my songs that now I hear them even when he is not there! And Nicolas’s guitar work is so creative and tasty, and it adds that steady rhythm over which Lincoln and I can go any direction. We are on the brink of announcing a regular Sunday happy-hour show in SE Portland, so stay tuned for more about this dynamic trio!